There are still several Brighton Corporation Tramways shelters scattered about the town, having been constructed pre-1939 and served the trams, trolleybuses and buses – and indeed some are still in use nearly a decade after the Corporation sold Brighton Buses Ltd. They were constructed in timber, and I recall a number (some of which remain today) – this one at the Tivoli Crescent terminus (now set into the wall, rather than stuck out in the road), another at the top of Miller’s Road, the “Pepperpot” in Queens Park Road, the old Hollingbury trolleybus terminus at the top of Surrenden Road, St Peter’s Church, and of course the bigger shelter and office that used to be found in the Old Steine until its demolition in circa 1972. There was also one at Fiveways, well into the trolleybus era. The shelter from St Peter’s Church can now be found at the Chalk Pits Museum at Amberley. I love these old shelters. I don’t think Martin is quite right about one at the top of Miller’s Road – do you mean by the Dyke Inn which would be Highcroft Villas? Another one still in situ is at the junction of Ditchling Road and Upper Hollingdean Road. The man credited with the job of constructing these shelters from 1910 was William Noyce. The fact that some are still in use today is a fine tribute to Walter. Incidentally, his grandson, Reg Noyce, also worked in the Corporation Transport workshops from 1934 until his untimely death in 1983. He was the last former Tramways man with the department. William? Where did that come from! It was Walter Noyce. Humble apologies. As a child (d.o.b. 1939) living in Stanmer Park Road, I remember the tram shelter at the top of Ditchling Road, near the entrance to Hollingbury Golf Course. I was told that my great grandfather, John A Monet, a carpenter with the Corporation had helped to build them. He lived at 62 Princess Road in 1901, designing and practical role. Peter Ticehurst is quite right, it was in Dyke Road near the top of Highcroft Villas, but to the other side of the junction rather than the Dyke Inn side. I called it Miller’s Road, because that was the road I’d have come up, rather than Highcroft Villas or Dyke Road, coming from Preston. The large tram shelter that formerly stood at the south end of the Victoria Gardens opposite the North Gate of the Royal Pavilion was moved to the seafront in 1948 to become the Aquarium Station of Volk’s Railway, and although modified several times since then is still in use today. No Peter, you were correct first time, it was William Noyce. He was my grandfather and my middle name is William, after him. Some of us volunteers at Amberley Museum are helping to restore the Dyke Road Park shelter which is now the ‘Village Square’ shelter and on stripping out some of the later day hardboard panels, I found a brand new packet of Silk Cut cigarettes. I wonder how long they had been there. They are in the office if you want to claim them. Further to my last comment about the Amberley/Dyke Road Park shelter – does anyone know when it was built? Martin, you forgot one, there was a shelter between the Gladstone Arms and the cemetery gates: ‘the Arches bus stop’. Was this one saved or destroyed? 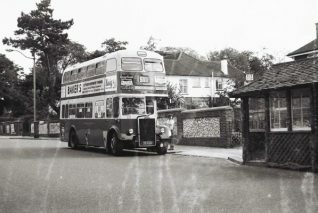 The Dyke Road bus shelter stood almost opposite Port Hall Road, in Dyke Road next to the park. When we were young in the mid 50s, we used to shelter there on rainy days. When playing in the park, I used to meet a boy called Spud Murphy. He was a teddy boy and wore a black jacket with white flecks, drainpipe trousers bootlace tie and suede thick crepe soled shoes. He had black hair Tony Curtis style, and was a lovely young man. Sadly he was killed in a motor cycle accident in Cromwell Road Hove in 1959. He lived in Chatham Place off the Seven Dials. He was about 17 yrs of age. The bus shelter was painted green and cream and was of a later date than the one at Tivoli Cresent. The one at the top of Highcroft Villas was very similar to the Dyke Road one. I would guess late forties early fifties that they were built, but I could be mistaken. I remember the old tram shelter opposite Port Hall Road, it was just at the top of the twitten that runs from Old Shoreham Road to Dyke Road. Another interesting fact, although I am too young to remember, is that almost directly underneath it was a WWII Air Raid Shelter, the entrance was from what is now the children’s play ground. I’m sure the kiosk at the junction of Rock Street and Eastern Road is a converted Brighton corporation tram shelter, it has now been extended to a useful size for retail. I know the kiosk well because I used to have a paper round in the late 60s delivering to Lewes Crescent and Chichester Terrace. The kiosk was my pick-up point for the papers; I was paid 15 shillings a week (75p) for a week day morning and evening delivery and a Saturday and Sunday morning delivery. Sundays I had to go out twice because the affluent people of that area always had the Times, Telegraph or Observer which were huge with lots of supplements. Hello Martin and all the other contributors here. In the book “Brighton Tramways” by Robert J Harley (Middleton Press 1992, ISBN 1 873793 02 2) there is a plan of the fullest extent of the tram track in 1938, which purports to show the position of all tram shelters. They are as follows: Old Steine (south end), Victoria Gardens (south end), St Peter’s Church (south east corner), Preston Circus (north east side), Preston Drove (top of Beaconsfield Villas), Preston Drove (east end, north side, adj Ditchling Road at Fiveways), Ditchling Road (east side, north of Florence Place), Viaduct Road (north side, adj Ditchling Road), Lewes Road (east side, adj Gladstone Arms), Lewes Road (Brighton Barracks terminus, north of depot), Elm Grove (north side, opp Queen’s Park Road), Queen’s Park Road (east side, adj Pepper Box), Lower Rock Gardens (east side, at terminus), Dyke Road (west side, opp Port Hall Road), Dyke Road (west side, north of Upper Drive), Dyke Road (east side, at terminus opp Woodruff Avenue), Race Hill (near top of Wilson Avenue). I am unsure about the validity of the last one taken from Fr. Bolton’s plan, as I cannot remember having seen any old photographs of tram tracks running beyond the junction of Elm Grove and Queen’s Park Road along the Race Hill. 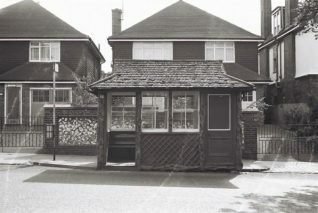 The tram shelter that stood opposite Port Hall Road is now in the Amberley Open Air Museum. Terry: On the Argus website, if you use “Tram Tracks in Time” in the search box at the top right of the page, a photo of the Dyke Road tram shelter at Amberley Museum should appear. It appears from the accompanying article by Adam Trimingham that there is another Brighton tram shelter in that museum, at the “Cragside Railway Station”. Following up on Alan Hobden’s comments: “…. and Race Hill (near top of Wilson Avenue). I am unsure about the validity of the last one taken from Fr. Bolton’s plan, as I cannot remember having seen any old photographs of tram tracks running beyond the junction of Elm Grove and Queen’s Park Road along the Race Hill.” There was certainly never one at the top of Wilson Avenue. I suspect the one mentioned in the plan should have referred to the shelter that was at the top of Elm Grove at the junction with Tenantry Down Road. It was set in front of the (then) Downs Cafe and provided welcome respite from the elements when waiting for the No.2 bus to Woodingdean. It was in contrast to the more modern shelter (built into the Brighton General Hospital boundary wall) on the opposite side of the road. Hello Brian. Thanks for your confirmation about the non-existent Race Hill shelter. The other one you mention, at the top of Elm Grove, was on the list as well, being at the junction with Queen’s Park Road. This, as far as I am aware, was always the terminus. I remember the Downs Cafe there. The name was painted on the roof in white paint as I recall. I looked in to the Rural Museum in Stanmer Park this week after visiting the nurseries nearby. Imagine my surprise when I spotted an original and complete Brighton tram shelter at the far end, which was being cleaned and repainted. It was thought to have come from Ditchling Road. At present, it is cream and brown on the outside. Hello again Brian. The shelter shown on Fr Bolton’s plan at the “Race Hill” was, as you rightly said, at the very top of Elm Grove at its junction with Tenantry Down Road, and Freshfield Road (not Queen’s Park Road as I had originally thought). I see from “Brighton Trolleybuses” by Andrew Henbest, that the shelter which was originally at the south east corner of St Peter’s Church is the one now in use at “Cragside Railway Station” at Amberley Museum.